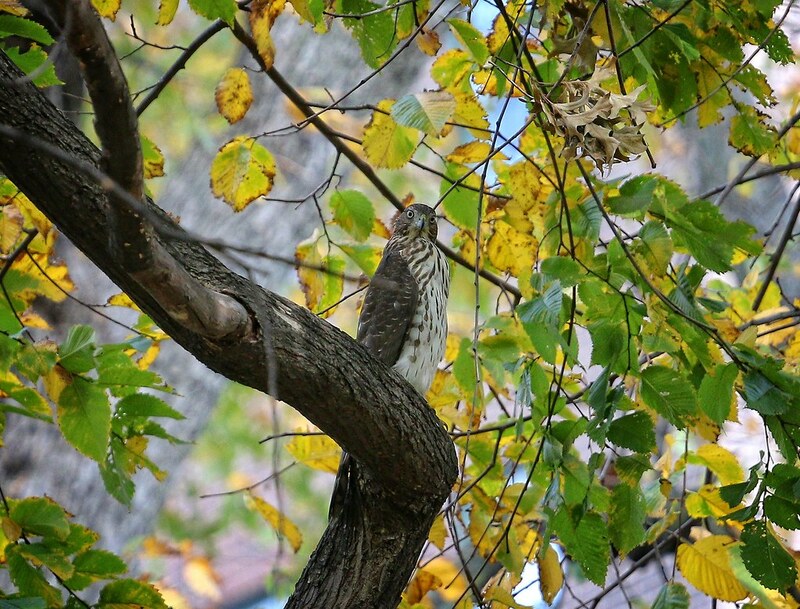 This last Saturday, I lucked out and found the elusive Cooper's hawk perched in plain sight in Tompkins Square. It didn't sit still for long, however, and took off almost immediately after I saw it. It's a juvenile, and note the interesting tail. It looks like at least one tail feather is still growing in. I saw the Cooper's again on Sunday, scaring up pigeons along First Avenue and 5th Street at 10:45am. 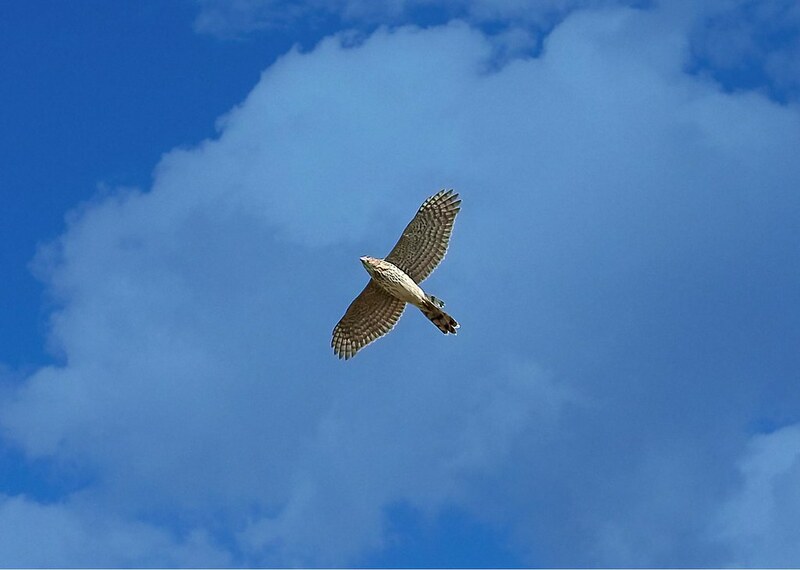 I believe it's likely the same hawk Roger_Paw spotted over Washington Square Park that same morning. 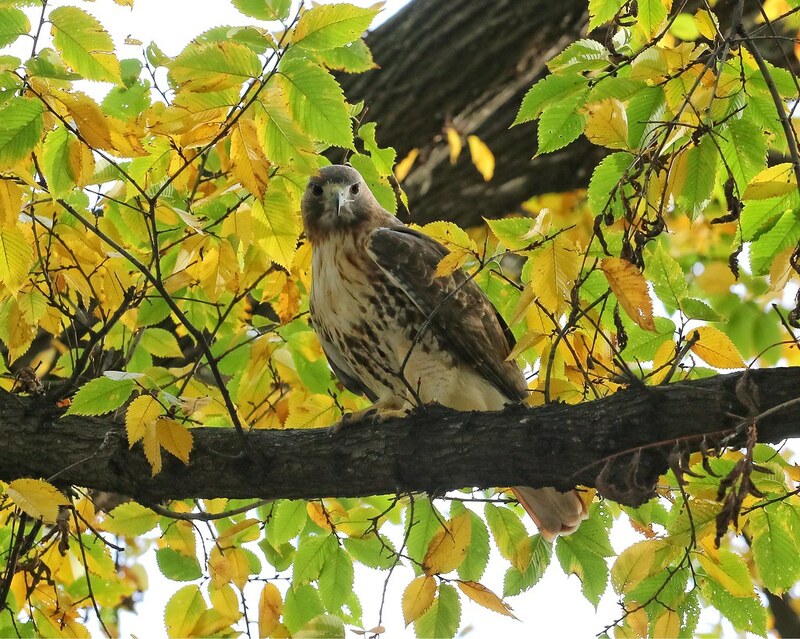 Anyway, as the Cooper's circled over Tompkins Square on Saturday, Dora, the resident red-tail, came to check it out. To my surprise, she seemed to look at the Cooper's for a minute or so, then flew south, out of the park. 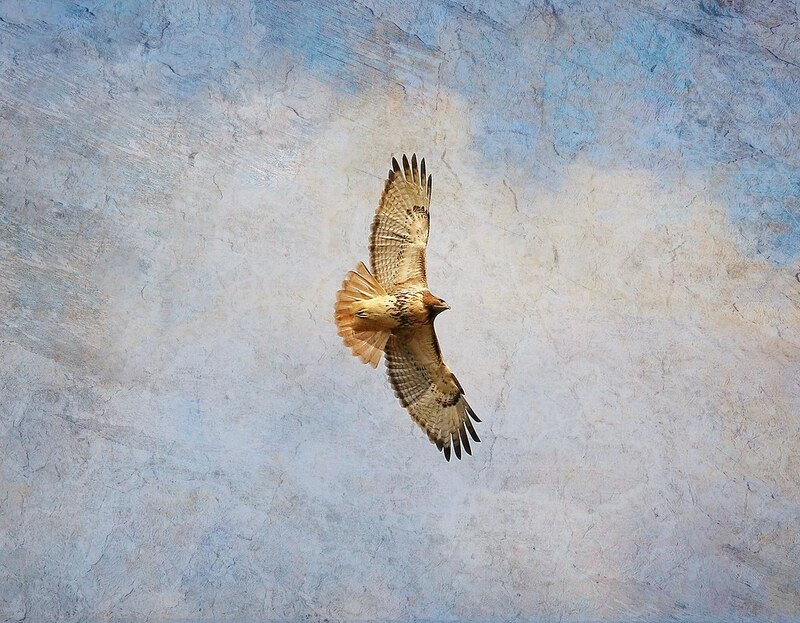 Fellow hawk-watchers and I have noticed that Christo and Dora have been pretty tolerant of the Cooper's being in their territory, but they are not so accepting of other red-tails. What could be the reason? 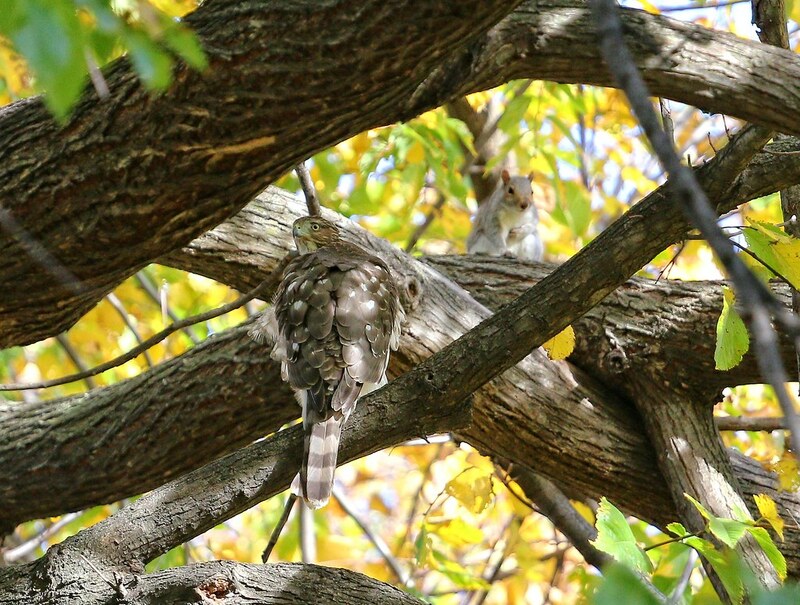 As soon as Dora was out of sight, the Cooper's reappeared, making two swoops at birds on the grass along the Avenue B side of the park. 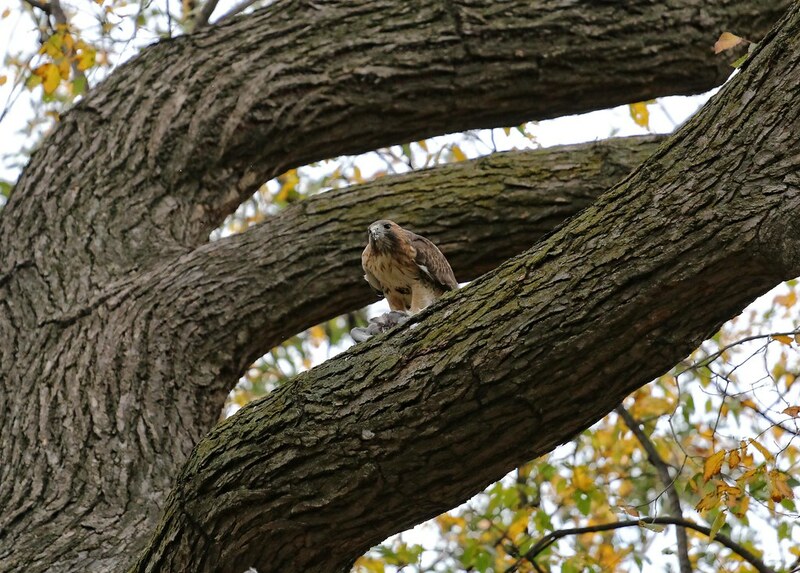 Coming up empty-taloned, the hawk settled in a tree near the 8th Street park entrance. It appeared to have a full crop. If I hadn't seen the Cooper's land, I might not have known it was there at all. 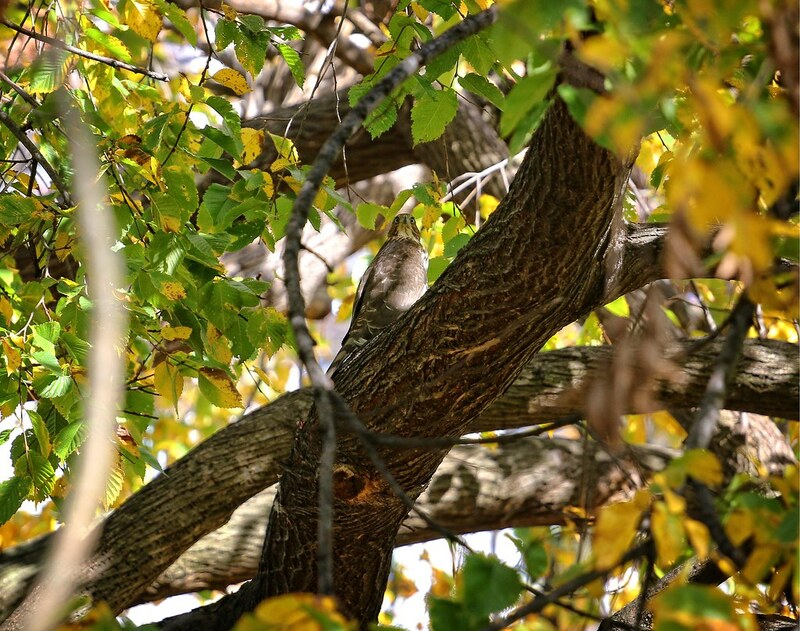 The hawk is very camouflaged, blending in with the trunk of the tree. The hawk stayed in this one spot for at least an hour. After some time, the 'owner' of the tree appeared to check the situation. 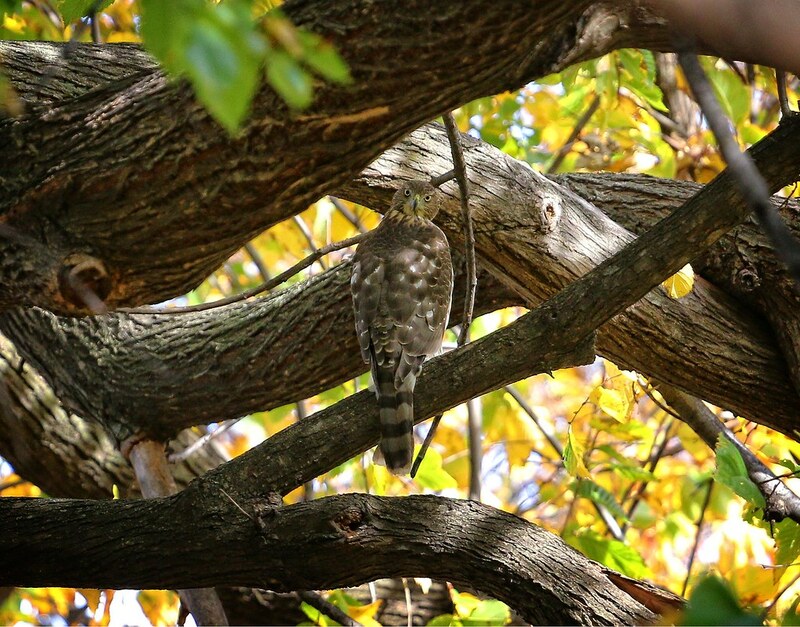 Cooper's hawks prey mostly on birds, but squirrels are not necessarily off the menu. This squirrel showed no fear. The Cooper's watched a Golden-crowned kinglet zip around the leaves for a while before deciding to fly off towards Avenue A. After the Cooper's left, Christo appeared. 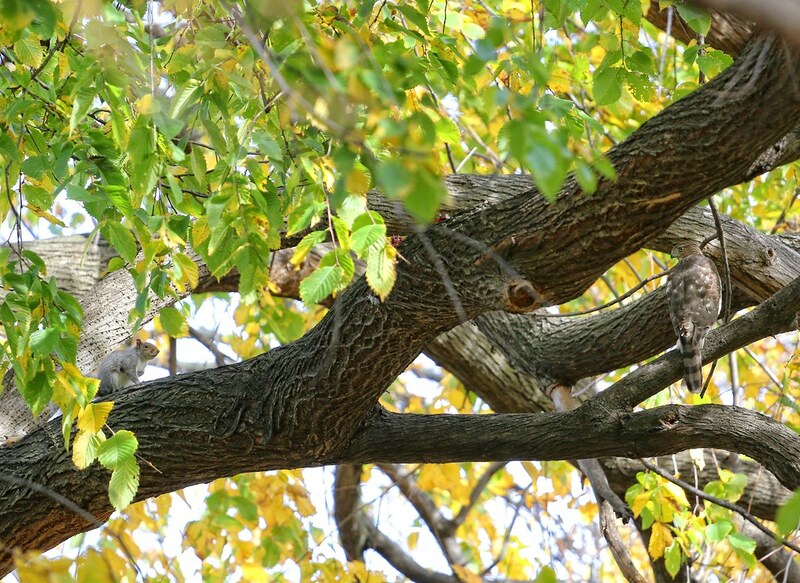 At about 4:30pm, Christo caught a pigeon near the chess tables, then ate it in the big elm to the northeast. As Christo ate, the Cooper's was spotted zooming up Avenue A towards 10th Street. At 4:40pm, I saw Dora flying from Avenue A, straight across the park heading east. She had something in her talons and the Cooper's hawk was chasing her. It all happened so fast, I couldn't get a photo. I followed them to the east side of the park where Dora was in the locust near the 9th Street park entrance eating a pigeon. The Cooper's was nowhere to be seen. This was the first time I've ever seen Christo and Dora each eat separate meals simultaneously on opposite sides of the park. I'm not with them all the time, but I mostly see Christo catch the food and then they share it. The last time I actually saw Dora catch and eat something on her own was October 19, 2014. This not to say she doesn't do her own hunting, but I rarely see her in action. However, something didn't seem right about the Cooper's chasing her and Christo not reacting to the commotion. Could it be that the Cooper's caught the pigeon and Dora stole it? That would explain the chase. Unfortunately, despite several people observing the hawks at the time, no one saw which hawk actually caught the pigeon. I would like the Dora-stealing-the-pigeon theory to be true, because it's not the first time I've seen it happen. 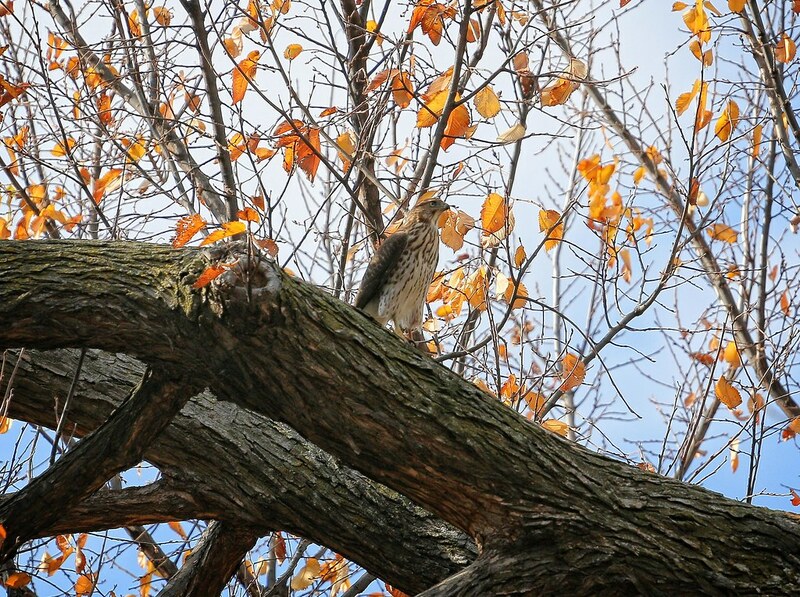 In January 2015, I witnessed Christo and Dora steal a starling from a Cooper's hawk in the park. Could they be allowing the Cooper's to hang out in their territory so they can steal prey from it? It's an intriguing idea, but can't be proven at this time since we missed those crucial seconds when the pigeon was caught on Avenue A.
I hope to be able to figure out this relationship the red-tails have with the Cooper's. For me, it's really fascinating.